When my brother Fish turned thirteen, we moved to the deepest part of inland because of the hurricane and, of course, the fact that he'd caused it. So begins the story of the Beaumont family. The Beaumonts are special. On his or her thirteenth birthday, each child comes into their savvy. Fish Beaumont causes storms. Older brother Rocket is electric, able to keep the Beaumont house lit up during a black out and jump start the old family car. Mrs. Beaumont has the savvy of being perfect (even when she messes up, it's perfectly awful). And grandpa can move the earth. Savvy opens right before Mibs Beaumont's thirteenth birthday. She's understandably excited, wondering what her savvy will be. Rocket says that girls never get the "big" savvies, but Mibs isn't so sure. Will she be able to walk through walls? Float in the air? She can't wait to find out. But then something awful happens. There's an accident and Poppa is in a coma. And suddenly Mibs knows what her savvy will be. Well, she doesn't quite know, but she knows that it'll be something that will help Poppa get well. It just has to be. Savvy is a story about finding oneself. About growing up and about staying young. It's about having an adventure and being there for the people you care about. It's about finding your savvy, even if you aren't a member of the fantastic Beaumont family. I had the pleasure to meet Ingrid Law last weekend at the YA Lit Conference and after hearing her talk about her book (and hearing my coworker J rave about it), I just had to pick it up. I'm so glad I did. Savvy is poetic. It's full of fun words, real words, that are used in unique ways. It also feels like a tall tale, which I love. Rich descriptions and multi-dimensional characters make this a novel not soon forgotten. Ingrid told us she's working on a sequel and I, for one, cannot wait. The book's also been optioned for a movie from Walden Media and that would certainly be something to see. Savvy is getting starred reviews all over the place (well-deserved!). It's also been reviewed by Sarah Miller, Little Willow, Literate Lives, Becky, and Professor Nana. You'll certainly want to check out the following: Ingrid Law's blog, the Savvy website (complete with book trailer), Ingrid Law's website, Little Willow's interview with Ingrid Law, Fuse #8's interview with Ingrid Law, and Ingrid's tall tale about how the Beaumont family got their savvy. 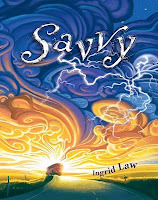 Savvy's on the ACPL Mock Newbery list and Anderson's Bookshop's Mock Newbery list. Savvy is SUCH a fun book. I definitely recommend it. Glad that you were able to meet Ingrid. Thanks for linking!